This is an urgent message for Jay Mariotti. Jay, please read this. 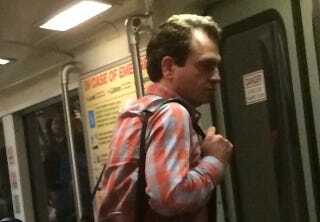 My girlfriend and I just sat behind Jay Mariotti on the BART from SFO to downtown. It was hard not to spy on his phone once I recognized him and because he was using an iPhone 6 Plus. He has the most scatter-brained phone habits I’ve ever seen. Over the course of the 30min ride, he must’ve looked at no less than 20 different apps. He would open LinkedIn, nothing caught his eye, and it was closed within 5 seconds while his finger scanned the screen for the next app to open. He also got a text from a “Stephanie” reminding him to record “Ray Donovan” tonight, and he promptly added it to his to-do list on his phone. You have made a grave error, Jay. Please remove “record Ray Donovan tonight” from your phone’s to-do list immediately, because it does not air tonight, and in fact the show’s premiere does not air until July 12. Today, as I’m sure you know, is June 12. Hopefully we’ve saved you from unsuccessfully fiddling around with the DVR tonight.